What's Behind the Growth in the Frozen Food Category? Frozen food sales slacked off for around five years, starting in 2013, but by mid-2018, sales of frozen foods started picking back up again. Meals and appetizers showed the most significant growth in the overall frozen food category, and frozen vegetables showed strong growth as well. 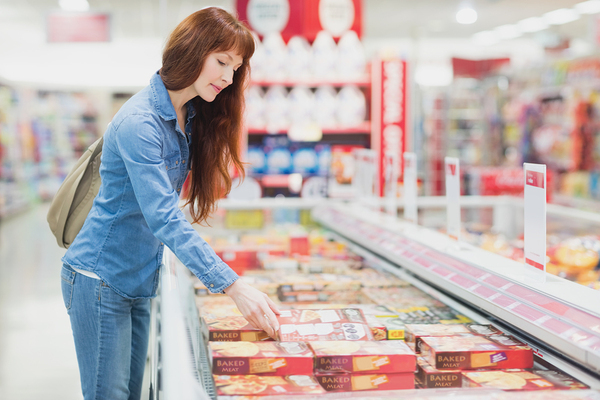 A report by Acosta showed that 26% of U.S. grocery shoppers bought frozen foods more frequently in 2018 than in 2017, spending around 9% more per trip on frozen foods. The frozen food industry has worked hard to engineer the turnaround, with innovations in both products and packaging to meet the needs of a changing consumer population. Now, frozen food offerings are far better aligned to emerging consumer demands. Millennials are leading the way in the resurgence of frozen foods, but the revival in frozen food popularity is taking place across generations, with 27% of Generation X-ers, 19% of Baby Boomers, and 19% of those in the Silent Generation reporting increased purchases of frozen foods in 2018. Many concerns about compromised nutritional values in frozen foods have been refuted, and there’s no denying the convenience of frozen foods. What’s more, it’s easier to plan use of frozen foods to minimize waste than it is with fresh foods. Top factors influencing consumers to buy more frozen foods include claims of no antibiotics, hormone-free, all natural, sustainable, and low sodium. Convenience and reduced food waste are factors that are tipping the balance in favor of many frozen foods over their fresh counterparts. Millennials are in their prime childbearing years, and few things make people appreciate convenience in food preparation like having to cook for a family. Frozen foods are quick to prepare, easy to store, can often be portioned out as needed, and make it easy for parents to include greater variety in the foods they prepare at home. Simple frozen foods (like bags of frozen vegetables and fruit) appeal to Millennials, who are wary of overly processed foods. Additionally, frozen meal kits have evolved to offer dishes that appeal to younger adults. Today there are more plant-based and ethnic foods available in the frozen aisle, appealing to a larger proportion of the consumer population than ever. In an age when anything and everything is bought online, frozen foods are one of the few categories that are still primarily purchased in the store. Seventy percent of consumers buy frozen foods to “hold them over” between grocery shopping trips, and in terms of sales, the frozen food category is bigger than all fresh “store perimeter” departments (except for fresh produce), as well as candy and snack foods. Frozen foods tend not to be impulse purchases, but are often bought with a specific day in mind for preparation. By 2018, nearly 3% of all in-home meals included a frozen dinner or frozen entre, up from 1.6% in 1998. The frozen food aisle offers more variety, healthier products, and better convenience than it used to, and it shows in the recent uptick in frozen food sales. Frozen food manufacturers are riding the wave, too, communicating the benefits of frozen food, engaging on social media, using influencer marketing, and developing strategic partnerships to create a message that resonates with consumers. Millennials – the biggest consumer demographic – are responding. With so many products in the frozen aisle meeting consumer demands for simplicity, nutritional value, great flavor, and less processing, there’s every reason to believe that the recent increase in frozen food sales is a genuine trend, and not a statistical anomaly. Hangar12 is at the forefront of CPG marketing strategy and more. Subscribe to our blog to stay up-to-date with our latest insights.